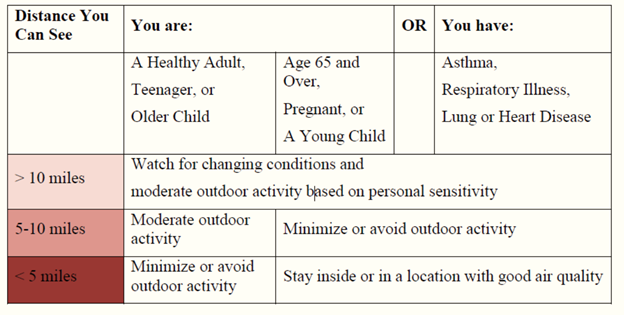 Anyone who can see, taste or smell smoke, including healthy individuals, should limit outdoor activity. People with heart disease, lung disease or asthma should avoid the outdoors entirely, as should children and the elderly. Typical symptoms of exposure to smoke include burning eyes, runny nose, scratchy throat, headaches, dizziness and nausea. Closing windows and turning off evaporative coolers when smoke is present helps to reduce exposure to the smoke and should be adequate to protect persons without respiratory problems. People with pre-existing conditions should avoid exposure to the smoke as much as possible and consult their physician if they have any questions. Stay inside with windows and doors closed. Make sure air conditioning units have a clean filter in the air intakes. Devices with High Efficiency Particulate Air (HEPA) filters can reduce indoor pollution. Use the recycle or re-circulate mode on the air conditioner in your home or car. Avoid cooking and vacuuming, which can increase pollutants indoors. Because smoke is highly visible, it is possible to estimate smoke levels and potential health impacts. The following guide indicates the actions to take to reduce smoke exposure when wildfire smoke is in the air. More information about how to protect yourself is available at http://www.coconino.az.gov/DocumentCenter/View/995. For more information regarding fires located in Arizona visit: https://inciweb.nwcg.gov/.